St. Clement Vineyards is a small premium winery, whose history parallels the rich winemaking legacy of the Napa Valley. St. Clement Vineyards is a small premium winery, whose history parallels the rich winemaking legacy of the Napa Valley. Here commercial wines under many different labels have been produced for more than a century. 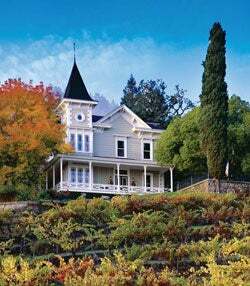 The landmark Napa Valley estate, established in 1878 by the San Francisco stained glass merchant Fritz Rosenbaum, was one of the first bonded wineries in the Napa Valley. But history was made here in 1975 when the St. Clement label was established. The estate now not only reflects the grandeur of a bygone era, but also showcases a winemaking facility that consistently produces highly respected premium wines. Today St. Clement is quietly building a solid base of vineyard knowledge, winemaking expertise, and long-term commitments collaborating with some of the most noted vineyards in the Napa Valley. At the heart of this effort are the mountain vineyards that produce St. Clement's benchmark wines: Steinhauer Ranch Vineyard on Howell Mountain, Progeny Vineyard on Mt. Veeder, and Armstrong Ranch Vineyard on Diamond Mountain, all of which create Oroppas Napa Valley Cabernet. Well-drained soils and the above-the-fog-line elevations of the Napa Valley produce superior mountain fruit that goes on to become wines of exceptional depth and richness. But it is also important to note what lies below the surface here: 50 different defined soil types, most of them rocky. St Clement uses this to its advantage by sourcing grapes from a diverse collection of small growers spanning north and south from valley floor to steep mountainside and from the gravel of the alluvial benches to the fiery red stones of the volcanics. This is rocky Napa Valley terroir at its finest and it is the essence of St. Clement Vineyards. Production is limited ensuring the quality of each vineyard that is sourced. And by adhering to the highest standards of winemaking, St. Clement has become a new discovery of decades-old expertise, knowledge, and exceptional wines. From the town of Napa, stay on Hwy 29 N for about 18 miles to St. Helena. St. Clement Vineyards is on the left, 1.5 miles north of St. Helena.